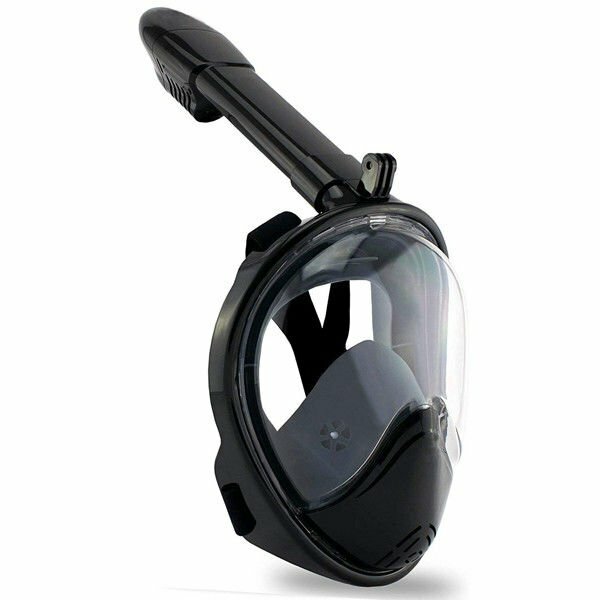 Panoramic Full Face Mask – Offering superior views over a standard diving mask, our 2-in-1 mask and snorkel offers a 180° view for beautiful underwater adventures. It is also equipped with a movable GoPro camera stand so that you can capture every amazing moment in the sea and share it with your friends and family. Deep, Easy Breaths – Taking in undersea sights is made easier with a unique full-face design that lets you breathe without holding a snorkel in your mouth, easier than ever before and can breathe naturally through your mouth or nose while you are snorkeling. Dry Snorkel system at the top allows the valve to close automatically to prevent water from entering the breathing tube. Anti-Fog Lens – The innovative breathing chamber provides streamlined airflow to eliminate fogging for crystal-clear fish and sea life viewing. Beginner & Youth Friendly – Great for youth and adults alike, our face mask with built-in snorkel reduces swimming energy wasted and lets you focus on surface diving.